By default when drawing charts from the User Profile Service SharePoint Org Chart uses an standard mechanism to retrieve the data that requires no additional configuration. Therefore an organization chart can be created quickly without requiring any modification to the SharePoint installation. However the Microsoft API that is used to retrieve the data is quite slow and on larger charts performance bottlenecks can occur. The additional configuration steps required to configure the chart are shown below. PLEASE NOTE : This guide is only applicable to SharePoint 2010 Server Edition. 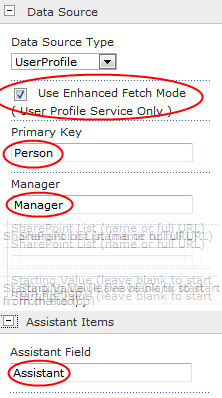 For SharePoint 2013 Simply Check the Data Source - User Profile > Enhanced Fetch Mode option. Locating the User Profile properties required. 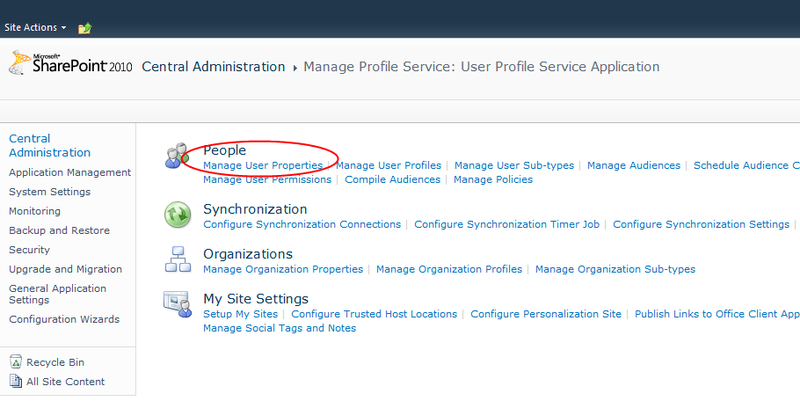 Begin by opening Central Admin and navigating to Manage User Properties in the User Profile configuration area. Within the Manage User Properties screen the edit the Account Name, Manager and Assistant properties in turn by selecting Edit from the menu as shown. Ensure that the property is enabled for search. 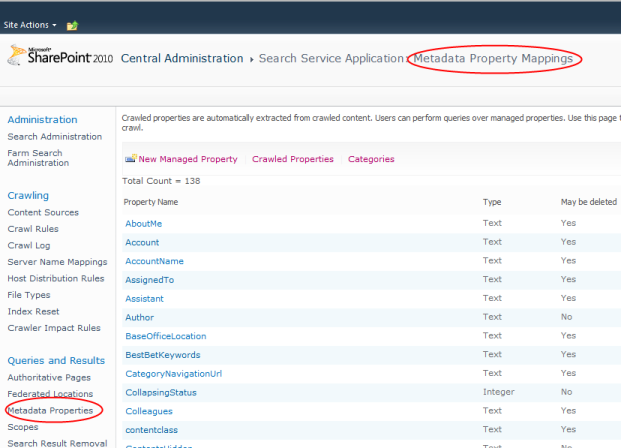 In the Search Settings section ensure the Alias and Indexed properties are checked as shown below. Note: If you wanted to show additional on the chart, such as a custom created field then you should ensure that they have the “Indexed” property checked. After completing steps 1 - 3 it is important to start the search crawler in order for the newly indexed properties to appear in the following screens. If you are unable or unwilling to run the crawler out of schedule then delay steps 5 onwards until the crawler has run on its current schedule. 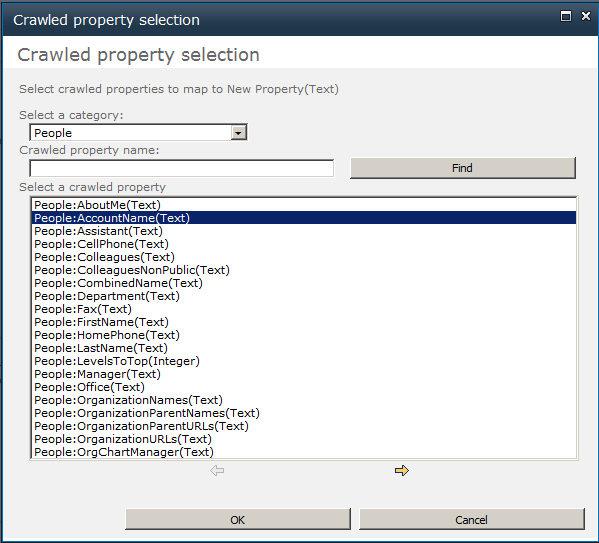 Start the Crawler by selecting the Start Full Crawl from the context menu as shown. Configuring New Managed Meta Data Properties. Once the crawl has completed the next step is to create additional managed meta data properties that the SharePoint Org Chart will use to draw the organisation chart. Navigate to the Metadata properties section. The three new properties will be mapped to the three User Profile properties that were enabled for searching earlier. Repeat these steps creating properties called Person, Manager and IsAssistant. The Crawled Property dialog box is shown. Choose “People” from the Category and then either pick the property from the list or use the “Find” button to locate it. Once the property mapping has been selected and the "Crawled property" dialog dismissed configure the "Allow this property to be used in scopes" in the User in Scopes section as shown. 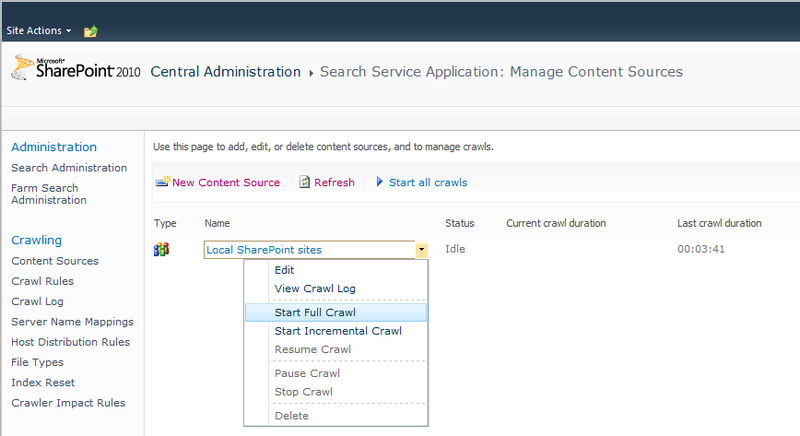 Once steps 5,6 and 7 have been completed for the three properties repeat step 4 Starting the SharePoint Search Crawler . Once the index has been crawled all the required information to build your organisation chart will be available to SharePoint Org Chart. 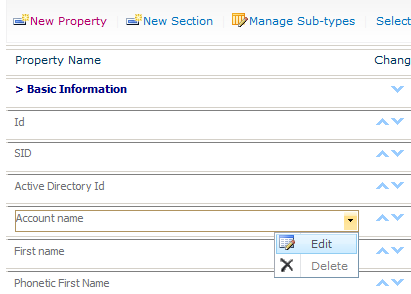 On a web part page containing a SharePoint Org Chart put the page in Edit mode and within the Data Source configuration section ensure that Data Source Type is set to "UserProfile" and that the Use Enhanced Fetch Mode setting is checked. Once pressing Apply the configuration is complete.